I recently shared the book Zooborns with you which was sent to me by Simon & Schuster. At the same time, they also sent me Rebecca Barry’s Recipes For A Beautiful Life: A Memoir In Stories. I was a little surprised when I saw they had sent me this book because I had only agreed to review Zooborns, not both books, and the reason for that is because I normally do not like memoirs. I find them self-indulgent and occasionally exaggerated. Even so, I found myself interested in reading this one, and I was not disappointed. “Writing with a delicate balance of humor and truth, critically acclaimed author Rebecca Barry reflects on motherhood, work, and marriage in her new memoir about trying to build a creative life. When Rebecca Barry and her husband moved to upstate New York to start their family, they wanted to be surrounded by natural beauty but close to a small urban center, doing work they loved, and plenty of time to spend with their kids. But living their dreams turned out not to be so simple: the lovely old house they bought had lots of character but also needed lots of repairs, they struggled to stay afloat financially, their children refused to sleep or play quietly, and the novel Rebecca had dreamed of writing simply wouldn’t come to her. Recipes for a Beautiful Life blends heartwarming, funny, authentically told stories about the messiness of family life, a fearless examination of the anxieties of creative work, and sharp-eyed observations of the pressures that all women face. This is a story of a woman confronting her deepest fears: What if I’m a terrible mother? What if I’m not good at the work I love? What if my children never eat anything but peanut butter and cake? What if I go to sleep angry? It’s also a story of the beauty, light, and humor that’s around us, all the time—even when things look bleak, and using that to find your way back to your heart.” The over arching theme of this book is “the heart wants what it wants,” as well as how to be happy when you have two small children, your husband travels a lot, and you’re trying to write a novel. Each very short and easily read chapter is titled with a how-to, such as “How To Sleep Better at Night,” “How to Behave When No One Understands You,” and “How to Organize Your Home Office,” although the chapters rarely actually explain how to do the thing they claim to. But that’s what makes the book great. It is hilarious as well as completely relatable, as Barry writes about struggles and her mistakes, rather than propping herself up or bragging as other memoirs seem to do. The stories about her kids are my favorites, such as when Barry went off on a rant about how as a mother she doesn’t “lay eggs,” but she does have eggs inside of her, and her son responded with a round of applause saying “Fantastic!” Or when her son did not want to get dressed so she brought him to school late and when she filled out the reason they were tardy, she wrote “Child would not put on pants.” I really wanted to read Barry’s blog, which she mentions in the book, but it seems to be available for invited readers only. I guess too many people wanted to learn more about her! She does have a published novel which I imagine I should check out! 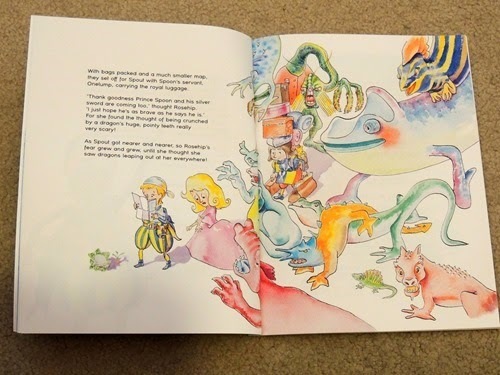 Also sent to me for my review, this time from Authoright, was a book for my kids called Teapot and the Dragon by Nick Jordan. “Welcome to the fantastical Tea Set Archipelago, where Teapot, the largest and most important island, is ruled over by good King Fennel and Queen Chamomile. Tradition states that their one and only daughter, the beautiful Princess Rosehip, must choose a husband. 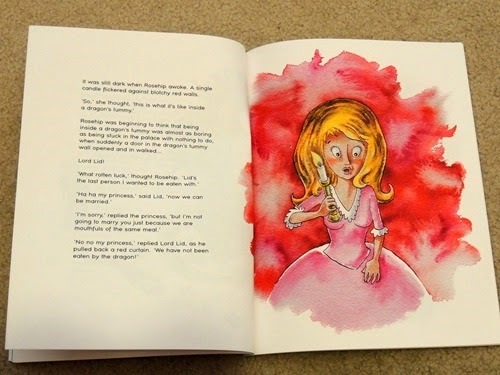 Unfortunately, the impetuous Princess has dreams of adventure and excitement and NOT a proposal. Oblivious to the Princess’ wishes, two suitors Prince Spoon of Cup and Saucer and Lord Lid of Lid, set sail towards Teapot to vie for her affections and hand in marriage. Hopeful husbands-to-be aside, a fearsome Dragon – whose delectation is ‘princess and chips’ – has been spotted by Murmur, the royal observer and magician to the King. This dreadful winged beastie has made a nest on the tip of Spout peninsula and, according to Murmur, it’s got to be fed…” I read this book to Simon while Zachary was out at Cub Scouts and he lay next to me on the floor and listened to every word. He loved that the island is shaped like a teapot and he liked the funny dragons a lot. He also enjoyed when the princess complains that being a princess is boring. 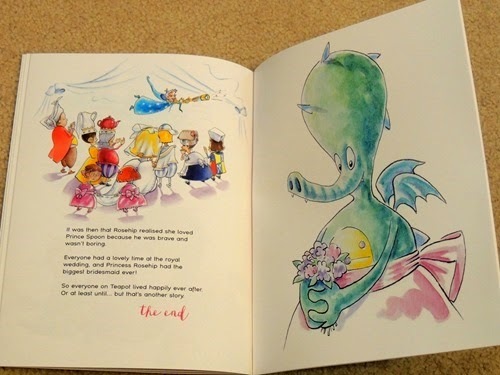 I liked the names of the characters and the amazing illustrations that look like they are painted directly inside our copy of the book! Read more about this book at teapotandthedragon.com! Thank you to the publishers for providing us with both of these books! Have you or your children read anything great lately?